All Fawnskin homes currently listed for sale in Fawnskin as of 04/19/2019 are shown below. You can change the search criteria at any time by pressing the 'Change Search' button below. "One of a kind North Shore lakefront property with spectacular 180 degree views of the lake, slopes, mountains, and dam. 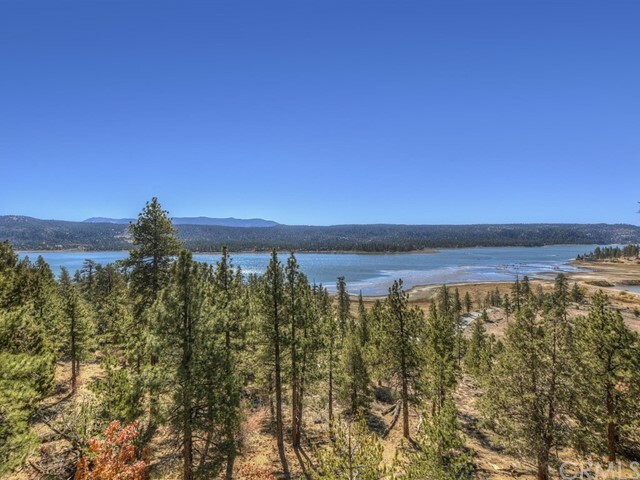 This deep water parcel has nearly 200 feet of prime lake frontage and adjoins a prime sandy beach. The home has never been listed and is being offered by the original owners for the very first time. It features an open living area with a rock fireplace, 2 large bedrooms with vaulted ceilings, a large mud room/ utility room and an oversized 1 car garage. Prime lots like this one don't hit the market often so come view it quickly." "*BONUS TO BUYERS AGENT*Quite possibly one of the best views in Fawnskin! 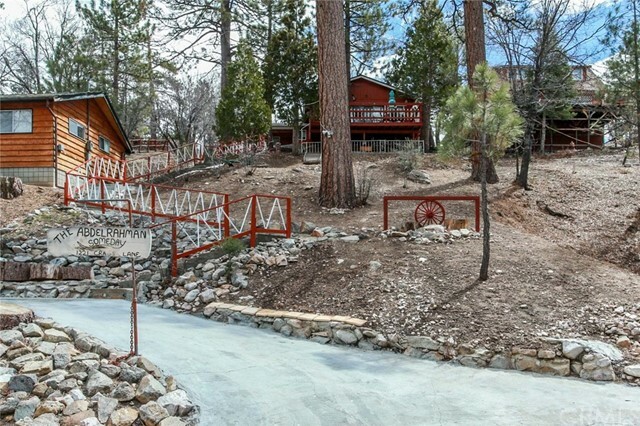 Enjoy the unobstructed 180-degree lake views, ski slopes & San Gorgonio mountain from this entertainers dream home. Take in the sunny southern exposure from the walls of windows and expansive decking. The house was originally built in 1926. Owners did a complete rebuild /remodel in 2014 with extensive use of stone & log vinyl siding with added insulation. Large open floorplan includes 23 - foot high wood vaulted ceilings with natural beams throughout. Relax after a long day on the slopes next to the native stone double sided fireplace in the living room or the main level master suite complete with steam shower & sunken jacuzzi tub big enough for two. Don't forget the gourmet kitchen with custom granite. This custom home boasts easy level access with a custom concrete stamped driveway & an oversized heated 2 car garage with custom cabinetry. 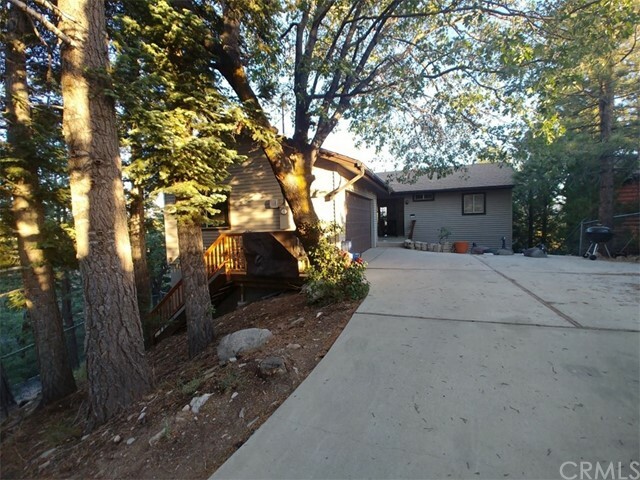 Back-yard complete with natural gas fire-pit & 2 regulation horse-shoe pit"
"The perfect mountain setting. Wait till you see the spectacular lake views and supreme setting from this immaculate custom built home including 4 bedrooms, plus office, plus loft, 2.5 bathrooms, full laundry facilities, huge vaulted ceilings, jetted tub in master bathroom, natural gas forced air heating throughout, gourmet kitchen with breakfast bar, open floor plan, beautiful floor-to-ceiling used brick fireplace in living room and a Vermont Casting wood stove fireplace off downstairs bedroom area, extensive redwood decking and 2 car attached garage all on an 11,965 sq. ft. lot backing to acreage." "The view is the thing. Wait till you see the spectacular 180 degree lake view on this architecturally perfect 4 bedroom, 3.5 bathroom custom home with vaulted ceilings, 3 fireplaces, pantry, den/library, full laundry room with deep sink, rockin' master suite with double walk-in closets, spa, fireplace, kitchenette w/fridge, 2-50 gal water heaters, 2 forced air units, complete fire suppression system, security alarm system, intercom system, storage loft (mirrored wardrobe), extensive redwood decking w/ wind protection, 2 car attached garages, timed irrigation systems, fenced dog run area and single 1,000 sq. 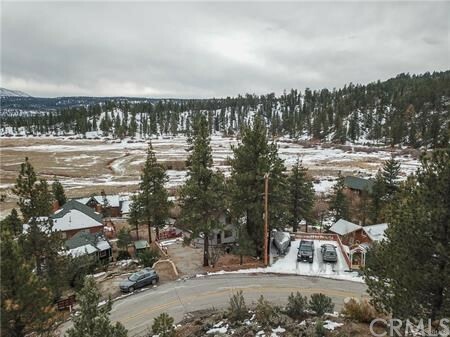 ft. sub-area w/ room to expand all w/ the best views in the Big Bear Valley." "Spend Less Time in Today's Stressful Life Style And More Time Enjoying Memorable Family Time ~ Tempting Buy in 'FAWNSKIN' If You Like The Idea Of All Seasons PANORAMIC VIEWS ~ No Matter If You Are Skier, Hiker, Nature or Water Activities LOVER ~ We Got You ALL Covered ~ Or Simply; Just Get in The Jacuzzi...Decompress Sip Some Wine and Chat While Contemplating The Serenity Of The Lake Views ~ Authentic Wood Floors! Perfect for 'Slow Dancing' :) ~ The Residence is on 'May Be' The Most Picturesque Big Bear Lake Area, And It Looks Like Something You'd See in a Travel Magazine ~ Owner Invest over $100K In Up Grades ~ Wait Till You Open The Door And See The Unexpected WOW Cozzy Open Layout ~ Also Here Are Some of The Fun Items Incorporated Into The Residence: Low Maintenance Backyard (Synthetic Turf), Fireplace, AC Unit, Electric Generator (Peace Of Mind), 110v Jacuzzi/Bar, 2 Car Garages, Steep Driveway May Fit a 18 Foot Boat /Trailer. 2 Blocks Away from Town and Captain John's Fawn Marina 7 Miles to The Village With All Kind Of Entertainment ~ Definitely a Good Fit to be Blend with Airbnb. $84K Discount sold as is. Leasing Option to Buy May be considered." "Spacious Fawnskin home with nice lake and mountain views. Woodsy interior with lots of beams and T&G walls and ceilings. Large eat-in kitchen with wood floors, tile counters and plenty of cabinetry plus a brick gas log fireplace. Even bigger living area with native stone fireplace and 2 sliders to the wrap around deck. 3 bedrooms, including 2 suites, 3 baths plus pantry area and mudroom with sink. Upper level suites with large den/loft area in between. Master suite has impressive walk-in with cedar lined closet, built-in dresser & vanity, plus a huge balcony with amazing lake and mountain views. 2 spacious attic areas are great for storage. Street level garage with built-ins plus 220V and beefed up electrical for those power tools! There's a separate exterior storage on the side of the garage as well." "This is a 2423 sq. ft. home, with 4 bedrooms, 3.5 bathrooms that sits on a 6600 sq. ft. lot. It's an open floor plan, with the living room , Kitchen, Dining room, and 3/4 Bathroom, on the main floor. There's a wood burning stove in the middle of the Living room and access to a Large deck off the Living room and Dining room with beautiful views. The top floor has 3 Bedrooms and 1 is a Master Bedroom with a 1/2 Bath and a full Bathroom attached, Lots of closet space and storage. There's a down stairs Bedroom with a sitting area, full Bathroom, and a door to work shop/storage. A one car garage attached, with access from the Kitchen. Landscaped backyard and lots of fruit trees. Sold AS IS." 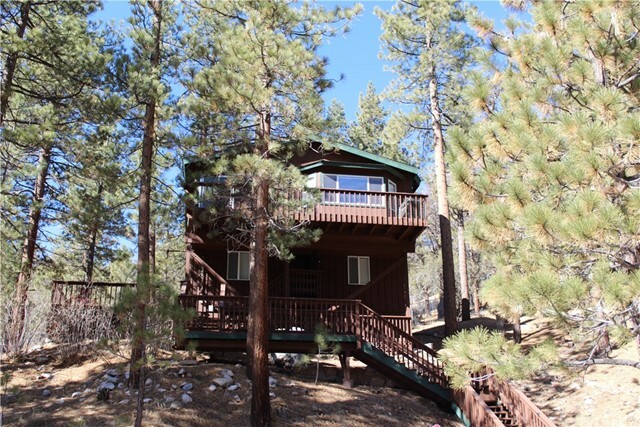 "Great cabin tucked in the trees yet close enough to marina, town, shopping and dining. 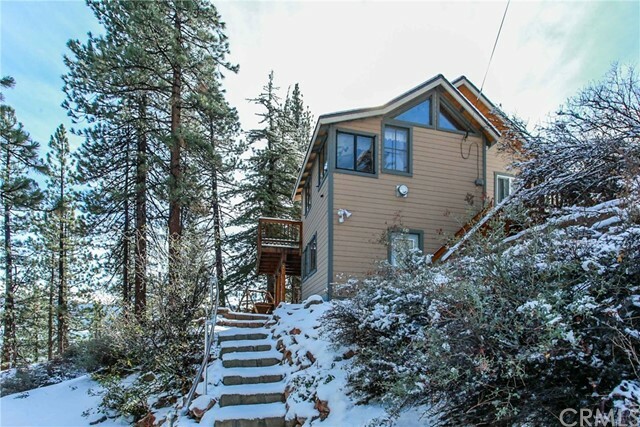 This cabin has been well cared for and loved, quite location on top of the hill. Large lot with plenty of parking for guest off street, even have room to build a garage. Large storage area at the rear of the house and can be accessed from covered walkway, has room for all your mountain toys. 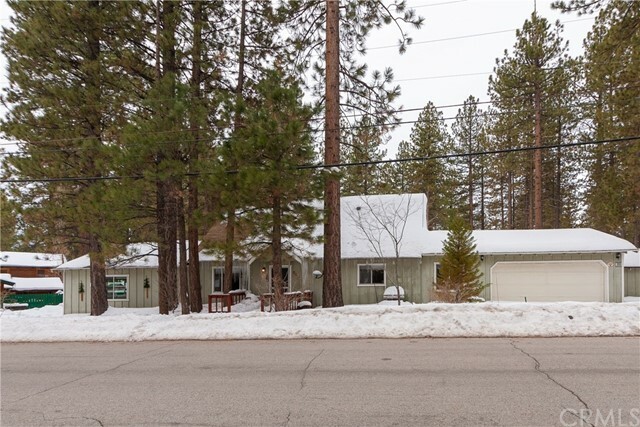 Two fireplaces one in living room and one in dining/kitchen area, plus two separate wall heaters for those cold winter nites.C"
"Incredible Lake & Mountain Views in this beautiful 1 bedroom 1 bath mountain home. The San Bernardino National forest less than a block from the front door! Just open the door, come in, sit back and relax by one of the 2 fireplaces, and enjoy the view. This home is truly move in ready. This 1350sqft gem boasts 2 fireplaces, Dining, Kitchen, Office, & Master Bedroom. The open and airy floor plan provides ample natural light throughout the home. Bright remodeled kitchen features, stove with self-cleaning oven, dishwasher, microwave and garbage disposal. New Natural Gas Weber Grille on deck for easy access while entertaining. The Lower level contains the Master Bedroom, Small office/den and closet with a stackable Washer and Dryer. This well insulated house also contains an additional 625 sq. ft. of unfinished basement, which has potential to be converted to more living space. 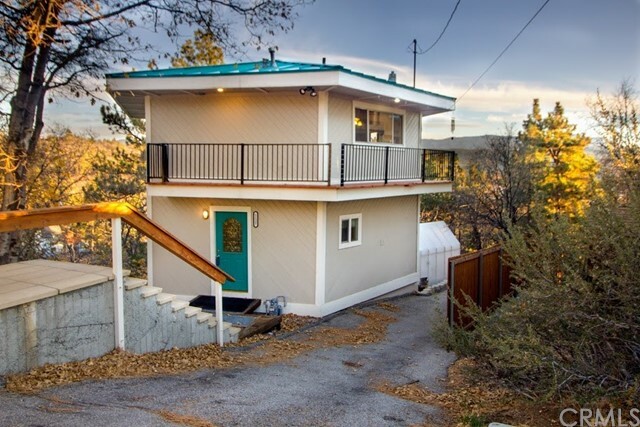 Constructed in 1976, this house has many upgrades. The 7,689 sq. ft. lot also includes a 96 sq. ft. Solexx Green House, hydroponic garden and solar powered." "Step back in time to the roaring twenties! 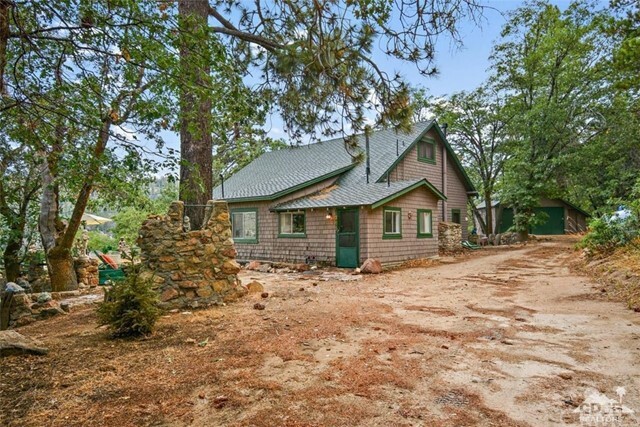 Great Gatsby like parties can be yours in this 1920 Government Lease cabin that has it all; 700 square foot great room with massive rock fireplace that looks out onto Big Bear Lake. Master bedroom with it's own bathroom is located on the ground floor, two additional bedrooms upstairs. Butler's quarters are within basement with library, work room, firewood storage with dumb waiter lift. The two car garage has additional storage below it. Patio areas abound making this your summer destination playground!" "Gorgeous Lake, Ski Slope, Mountain and forest views from this spacious fully furnished cabin in the woods. 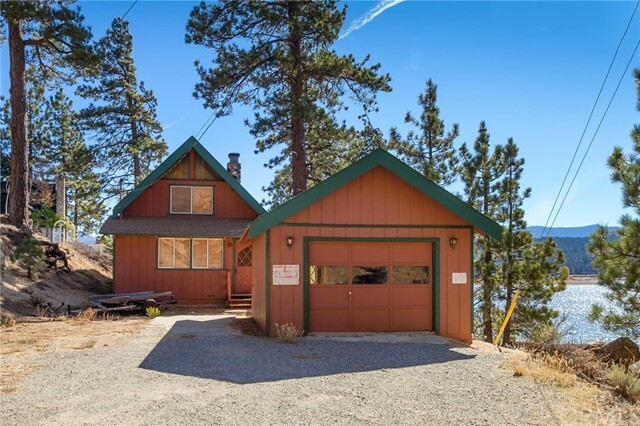 Extra large living room and sitting area with picturesque views of Big Bear Lake and the mountains. 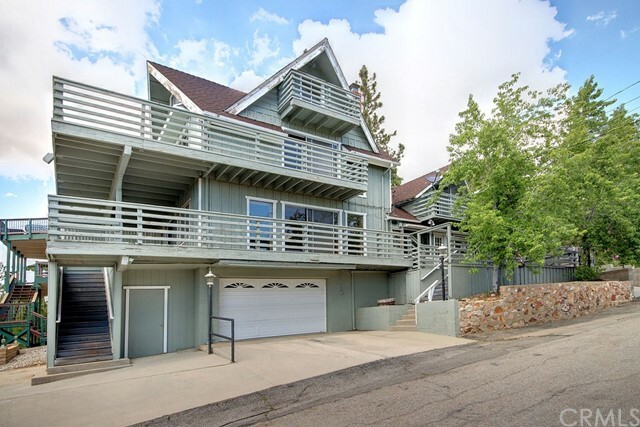 Bedroom on main level, Loft used as second bedroom, Spacious deck off of dinning, Relaxing setting, Large patio area over looking the Lake, ski slopes and mountains. Large utility room with laundry hook ups, Work bench and storage area. New roof & new flooring. Backs the National Forest, many hiking trails near by. Across the street is the west boat ramp giving you easy access to the lake for fishing, boating, canoeing, jet-skiing, paddle boarding and much more! Views everywhere you turn! 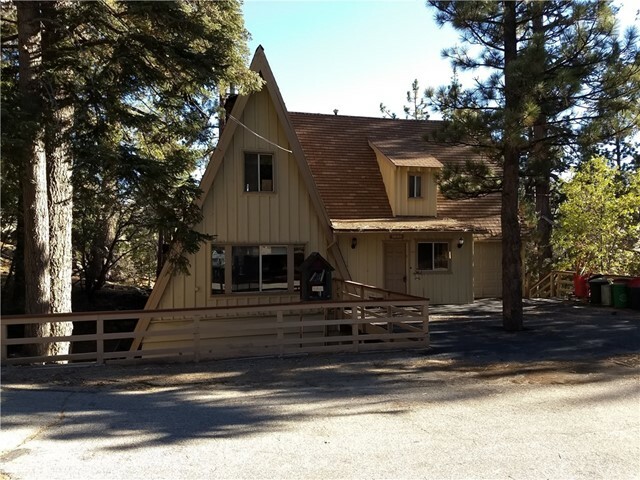 Don't miss out on an opportunity to own a little piece of paradise in the Mountains!This is a USDA Recreational Residence with a 20 year lease. No title. Cash only." "This beautiful mountain home is a MUST SEE!!! This gorgeous home boast 4 bedrooms and 1 bathroom with just over 1,000 square feet of living space. 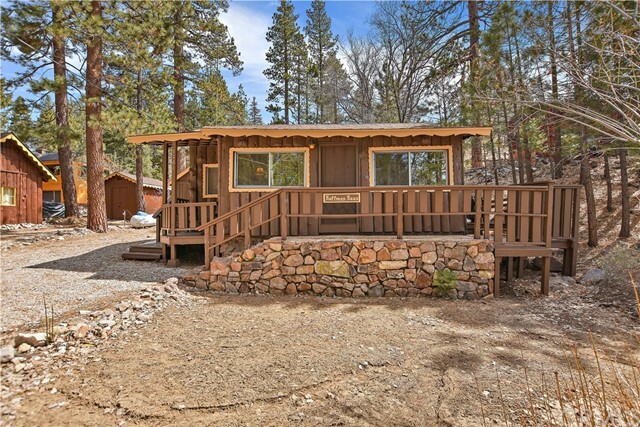 Located minutes away from Big Bear Lake, you will not find a more cozy, comfortable, and competent home that is ready for you to add your personal touch. This is a perfect opportunity for you to truly make it your own, and create the mountain home of your dreams. 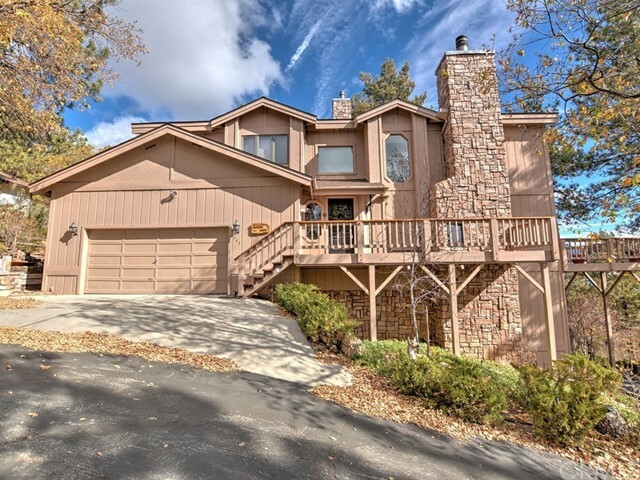 In the Bear Valley district, you are just minutes away from the best schools in the area. With a large lot size of 5,000 square feet, there is more than enough space to personalize this home to your liking." 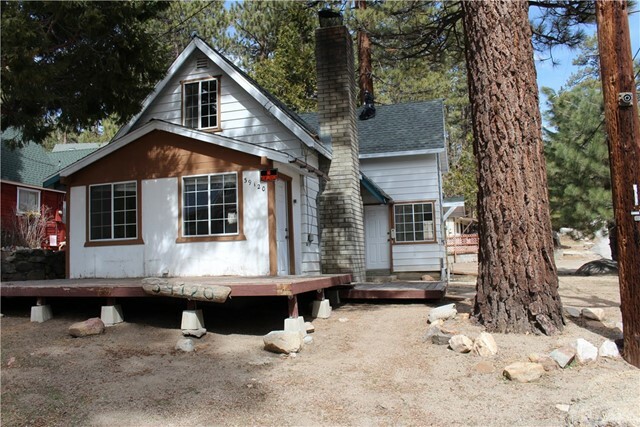 "Quaint & rustic cabin located on the quiet side of town in Fawnskin with everything you need for a romantic getaway in Big Bear ~ Built in 1922, it has been nicely upgraded and has a lot of mountain charm ~ Beautiful Okeefe & Merritt stove in the kitchen ~ Lots of warm knotty pine T&G in the living room and bedrooms ~ Recently painted ~ Newer composition shingle roof ~ Newer flooring ~ Detached 1 car garage with workshop ~ Two decks ~ Original vertical log siding ~ Easy access from Highway 38 ~ Close to downtown Fawnskin, park, lake, and Captain John's Marina ~ Property is being sold furnished, so bring your toothbrush and come start making memories!"